Posters like this one were used to encourage people to become members of the American Red Cross (ARC) at the cost of one dollar per year. The depiction of an ARC nurse, an ARC ambulance, and a wounded soldier against the backdrop of an explosion, were designed to pack an emotional punch while asking for a minimal financial commitment from the American public. This poster was distributed as part of a major fundraising campaign organized by the War Council of the American Red Cross and its chair Henry P. Davison with the goal of raising 100 million dollars. The War Council of the American Red Cross was an all-male group of bankers, industrialists, and community leaders charged with restructuring the American Red Cross (ARC) for wartime. Davison recruited a former Secretary of the Interior and men he considered to be the most talented US corporate leaders, including executives from Anaconda Copper, the American Tobacco Company, American Steel Foundries, the Guaranty Trust Company, AT&T, and American Express, to volunteer in critical organizational ARC posts. 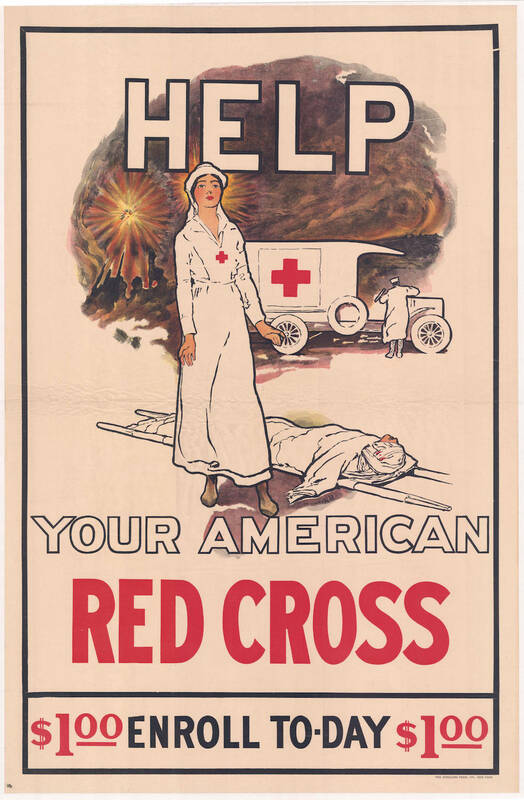 “Help your American Red Cross,” Digital Public Library of America, https://dp.la/item/2aadca904efb8cb8f669ad34389a3271. Courtesy of Indianapolis Special Collections Room, Indianapolis Public Library and Indianapolis Marion County Public Library via Indiana Memory.